NOTE: The sound files made available below were not re-published by Columbia, and with the lapse of the Jay Bharat copyright, they remain, as far I can establish, in the public realm. Such music deserves to be heard, again and again. It has - sad to say - languished, buried for decades, in private and public collections. It is made accessible here even though the sound is rough. The interest of the music almost transcends the mere sound - if one can accept that paradox! Grateful acknowledgement is made to several friends including Suresh Chandvankar (Mumbai), Mr and Mrs Rao (Canada), and Aniket and Urmila Bhirdikar (Pune) for the information given above. Thanks to Rajan Parrikar for guiding to me the photo and accompanying article, which makes salutary and sad reading. 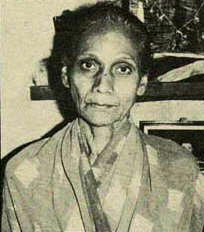 Note: In addition to the above, Sushila Tembe recorded several songs in Kannada. I'd be happy to add the transcription/transliteration of those records here.